Carmel of Rabid Reads sort of recommended BLACK ROOK by Kelly Meade to me so I know I'm in good hands especially as Cornerstone Run Trilogy is a werewolf series. I'm not sure how deep the plot goes series-wise but as far as BLACK ROOK is concerned, it's packed with action, magic, and mayhem. I love the Cornerstone pack, their werewolf hierarchy and mythology and I will read the next one for sure. First off, I want to personally answer Carmel: Yes beech, I'm slacking! Hence the bulleted review. You should read her feedback for BLACK ROOK at Rabid Reads, I implore you to do so because mine is very condensed and hers has more meat... because I'm slacking! I love the wolf hierarchy, you have white wolves, black wolves, and grey wolves, and each wolf color determines your position in the pack, each is determinant of a unique ability. For example, black wolves means you're the dominant and can be pack Alpha; white means you can breed with other otherworldly creatures and can calm other wolves; gray is just a level or two up from being chopped liver. I love the names of the brothers, it's very rock 'n roll: Rook, Bishop and Knight McQueen. Didn't really connect with Brynn Atwood and her romance with Rook. It can be slow burning because it happened towards the last third of the book but as BLACK ROOK's events covers a 3-day period so it's kinda insta-love-ish but as these are wolves, it's expected that there will be insta-mating. Although "insta" is a peeve of mine, it's part and parcel of a werewolf story. Their beasts just knows their mate and between you and I, I'm envious of that. If only it were that easy in real life, right? The hook in the blurb about Brynn's vision and Rook possibly killing her dad was revealed almost immediately. I hoped KMeade made the characters work for it more. Brynn is also the lone Magi amongst a pack of werewolves. Her father is a high-level Magus and despite the twists and turns in the story, I wonder why her father or their congress didn't send even a small contingent to "rescue" Brynn or exploit her connection to the pack. I disliked Brynn's father. I can't sympathize with him regardless of his reasons why he kept a lot of secrets from Brynn. I loved the real conflict of BLACK ROOK, it has a dash of mad science to and who doesn't love crazy conspiracies? Although I wish these Magus and the congress were made to be more threatening. They're after werewolves but it felt like the killing spree was more of a rogue mission than a sanctioned one. The secondary characters, especially Rook's brothers, were well fleshed out too. In fact, BLACK ROOK doesn't feel like it's just Rook's story except for this being his HEA. Knight and Bishop played important roles here and were carefully and thoroughly introduced to us by KMeade. I look forward to reading their respective books in the future. 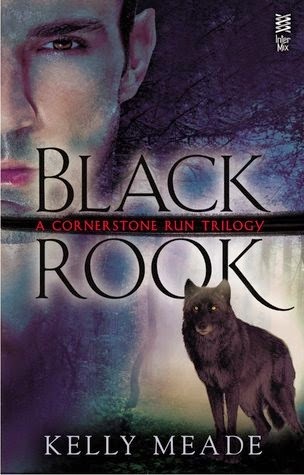 BLACK ROOK gave me old-school PNR feels. I missed reading old-school PNR. I'm happy you enjoyed the bullet points. I can't write cohesive paragraphs right now for some reason. I really don't like Brynn"s father either. But I think I liked the book more than you maybe because it was easier for me with Brynn but I confess I was annoyed how she accepted that she was useless and was happy about it but well otherwise I was ok.
Ooh I forgot about that! Yeah, she wasn't the fierce female I expected her to be. She did go to Cornerstone with an agenda and that took a lot of balls. I guess that was a fluke? Insta love is really starting to bother me as well lately, more so than it ever has. I think for now, I will pass on this one. I guess it's a given when it comes to shifters. Their beasts know better when it comes to "love" so it was expected and didn't bother me as much. I'm not a fan of insta-love, but I accept it without a problem in this kind of books. I like what you said about the hierarchy, it makes this book sounds interesting and Camel's recommendation add to it. I'll add it to my TBR, but don't have a clue when I'll have the time to read it. I miss old school PNR sometimes, too. I like the world-building as far as the wolves go, especially the designation by colors. Very cool. I'm glad you liked this overall, Braine. Thanks for the review! I'm not a fan of insta-love. Insta-Love turns me off on most books that have it. The World building is essential to werewolf stories. Nice review. I'm not sure if this is for me. That's all right, different strokes for different folks. Heh - sometimes I prefer reading reviews in this format because they're easier see the points. ADD <-- I have it. ;) Seriously, this sounds interesting. I don't usually jump on wolfie books though. I am so bias when it comes to werewolf books. I will totally pick up a three star werewolf book but wouldn't even consider any other three star book. I just have a special place in my heart for werewolves. I have been seeing this one around lately and most people like it. I'm a werewolf girl myself and I'm with you on the 3 star books, I skip 3 starred contemporaries. I've been looking for a good werewolf series so I'll have to check this one out. You can also try Amanda Carlson, her werewolf series is good too! I also like fact that the color of their wolves determine how they stand in their packs...interesting. I read Carmel's review and totally bought this after reading it. I am excited to try it! yay! Can't wait to read your thoughts.